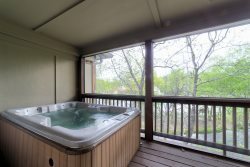 Rentals that are located within the City Limits of Helen, which offer the true alpine experience. Helen is nestled in the Blue Ridge Mountains on the Chattahoochee River. Helen now offers a unique experience for its visitors. Walk into town from many of our rentals and others may only be a carriage ride away. Cozy River Front Cottage Style Cabin, Fire Pit, Hot Tub. Newly Re-designed with Luxuries of Home. Fabulous Fishing, Sit on the deck and wave at the tubers as they flow by your rental cabin.